Inducted 1999. Played in Three State Tennis Tournaments in Hight School, Four NAIA National Tournaments in College. Long before Schuering moved into the court room, he ruled the courts of Quincy as one of the city’s best tennis players. A 1971 graduate of Christian Brothers, Schuering was the first player from the school to participate in three state tournaments. Schuering played the No. 4 position on the tennis team as a freshman and won 75 percent of his matches. As a sophomore, he posted a 13-8 record during the regular season and advanced to the state tournament by amassing a 6-1 record in district play. As a junior, Schuering posted an 18-3 record, then went undefeated at the district tournament to earn another berth to state. During the summer before his senior season, Schuering won three city tennis titles – the 16-and-under singles, the junior singles and the men’s open singles. 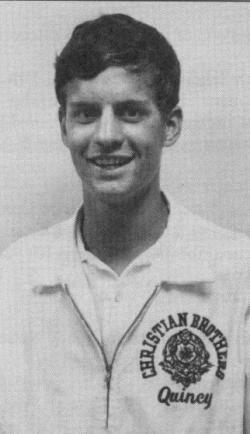 He was perfect during the regular season of his senior year at CBHS, winning all 19 matches without losing a single set. He also won the singles championship at the Little Six Conference tournament. In district play, he breezed through three opponents and then won the title 6-0, 3-6, 63 over Springfield Southeast standout Bill Franks. At the state tournament, Schuering reached the quarterfinals before losing to the second seed, Jerry Karzan of New Trier West. He finished with a 251 record. Schuering went on to play at Quincy College, where he was a four-time winner of the NAIA District 20 championship and a four-time qualifier for the NAIA National Tournament. He won four rounds at the nationals in his junior and senior seasons. Schuering was inducted into the Quincy College Sports Hall of Fame. He has also won seven men’s city singles championships. Schuering is now a Circuit Judge of the Eighth Judicial Circuit in Illinois. He and his wife Kate live in Quincy, and they are the parents of five daughters Emily, Julie, Maggie, Laura and Lucy.